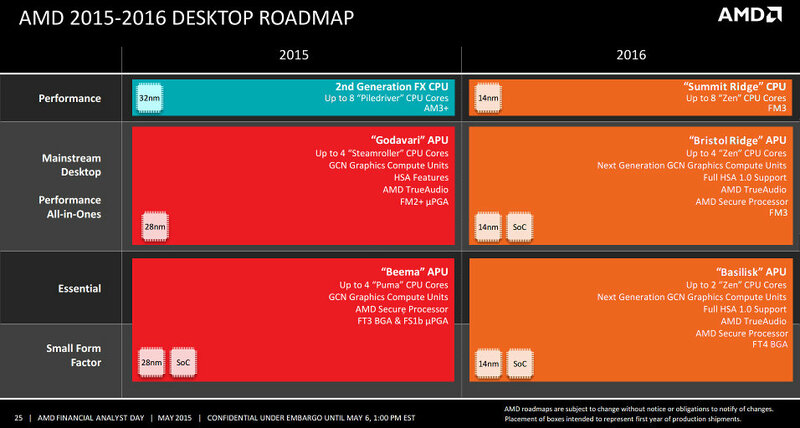 The leaked slides show that AMD is aiming to replace its current Piledriver based lineup of performance FX CPUs with a new chip called Summit Ridge in 2016. Capable of hosting up to 8 cores, Summit Ridge will be using AMD’s upcoming “Zen” architecture built on the 14nm FinFet manufacturing process. It will also be using the new FM3 Socket that’s designed to replace both the AM3+ and the FM2 sockets. Mainstream desktops will be getting the Bristol Ridge APUs that’s designed to replace the Godavari APUs (the Kaveri-refresh aimed for 2015 summer release). Bristol Ridge will feature a maximum of 4 Zen cores, AMD GCN graphics, as well as the FULL HSA 1.0 Support. AMD will be releasing the Basilisk APUs for the essential/SSF PC market. Basilisk will feature up to 2 Zen cores, down from the 4 Puma Cores found on the Beema APUs. This could indicate that the Zen cores will have stronger single-thread performance. By having only 2 cores, it may also leave more room open for graphics, or have an even smaller footprint. The FT3 and FS1b microPGA sockets on the Beema APus will also be phased out for the FT4 BGA socket. 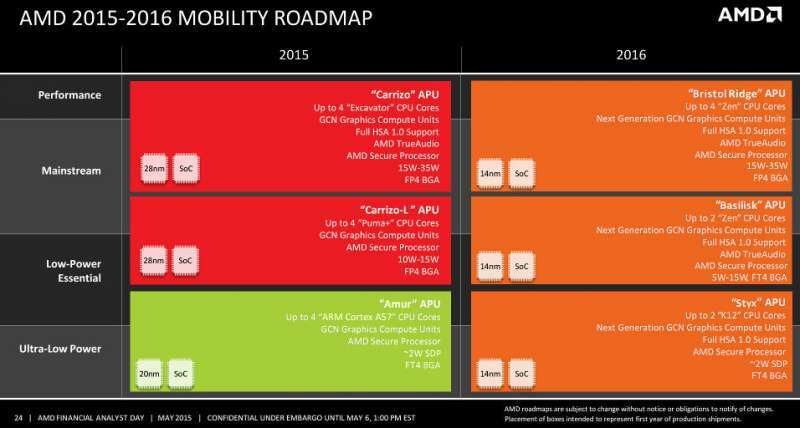 AMD hasn’t commented on the leaked slides or given any indication on what to expect in terms of performance or TDP of each chip. As always with these rumors, treat all information with a grain of salt. Update: AMD has contacted planet3dnow regarding the leaked slides. They’re apparently fake. We have been contacted by AMD with the request to remove the (image). According to AMD, the information presented thereon were completely wrong and AMD would misrepresent. AMD will most likely reveal official details on the “Zen” cores next week on the financial analyst day.